The Caledonian Canal reopened to all boat traffic today following the completion of repairs to damage caused by flooding. The historic waterway had been closed to boats since floods caused by heavy rain and melting snow undermined a weir at Cullochy near Fort Augustus, washing over half the structure away and causing a major breach in the canal embankment, in early March. A temporary rock dam was established at nearby Aberchalder Bridge to stem the flow before work began installing sheet piling across the remains of the weir and backfilling behind it with more than 1000 tonnes of rock and recovered material. 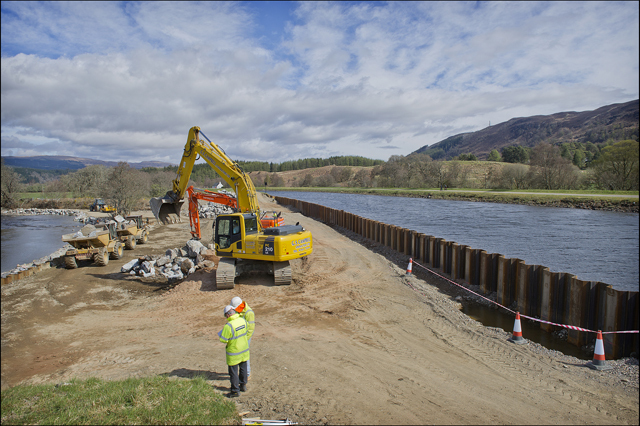 The teams then removed the sand and gravel that was washed out of the canal embankment and weir into the River Oich and, together with the rock retrieved from the dam, used it to reform the canal embankment. Steve Dunlop, Chief Executive of Scottish Canals, said: ‘The works to repair Cullochy Weir were among the most testing that Scottish Canals and its contractors have undertaken in many years and we’re delighted to announce the completion of the initial consolidation of the weir and the reopening of the Caledonian Canal to all boat traffic today.